How effective is Biomaster / Antibac AGP coated film? Very. 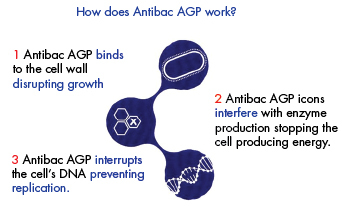 Biomaster / Antibac AGP is proven to inhibit the growth of bacteria by 99.99%. Is Biomaster / Antibac AGP film safe? Yes. It is based on silver ion technology, recognized for centuries with no harmful effects. Antibac additive is used in medical, food and water applications. What’s the difference between antimicrobial and antibacterial? An antimicrobial inhibits the growth of, or destroys harmful Micro-organisms such as bacteria, fungi and moulds. Antibacterial specifically prevents the growth of bacteria. Has Biomaster / Antibac AGP film been tested? MRSA, Pseudomonas & Salmonella. Our independently tested laboratory results can be made available on request. How long is Biomaster / Antibac AGP effective for? pipes which have been tested 7 years later and still exhibit antibac properties. Does Biomaster / Antibac AGP affect a product in any way? No. You can’t see, smell or even taste Biomaster / Antibac AGP. Is Biomaster / Antibac AGP effective against antibiotic-resistant Bacteria? How do I know if a product is Biomaster / Antibac AGP protected and can it be verified? implemented into your QC / HACCP procedures. Does Biomaster / Antibac AGP use Nano-silver technology? No. Our technology is NOT based on nano-silver. The average size of our particle is 2μm which is 12,500 times as large as nano-silver particles. 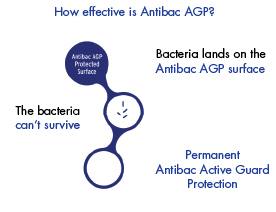 Why Biomaster / Antibac AGP is better than other silver based antimicrobial additives? supplier of antimicrobial technology for polymers, textiles, paper, paints and coatings.